I know I have been mentioning it in a few posts now, but I recently signed up for Julep Maven. 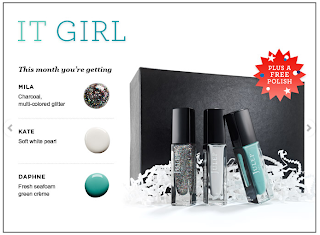 It's a subscription site for the Seattle-based brand Julep, which specializes in nail polish. I found out about it through my interest in signing up for Birchbox. I had no idea how many different subscription sites are out there! Anyway, I love make-up, nail polish, & other beauty products, and I also love getting packages in the mail. So, I have been pretty pleased with my decision so far to join a couple of sites. Julep Maven also has a special where you can get an introduction box for 1 cent, so there really wasn't anything to lose by trying it out! Last week, I got my intro box. My style was "Bombshell." I like that you can see the boxes & switch up your "style" beforehand. Though it takes out some of the mystery, I feel that it's important with a service so specific to just one brand and one main product (you don't want to end up with a bunch of colours you already have or don't like.) I was really excited about getting my box & thought it was definitely worth the penny & time to sign up! Julep Nail Vernis in Natasha. Red-Orange Creme. Julep Nail Vernis in Oscar. Uniform circles, dense gold glitter. Julep "The Best Pedi Creme Ever!" 2 ounces. A lot of natural ingredients. I have tried all the products & I really am happy with the formula for the nail polishes. I have read online that some people had problems with the tall bottles tipping over, but I didn't experience anything like that. The formula wasn't thick or goopy but was very opaque. Also, the pedi creme smells great & is super moisturizing. Though, I am not a huge fan of reds or oranges, Natasha is a very pretty colour, great for summer. I was definitely more excited about Oscar. I have been looking for a gold glitter polish to try out some ideas for nail art. Oscar is a very easy to work with glitter, it covers easily and is super dense. No fishing required! It also isn't too bumpy once dry. In order to try out the nail polishes, I wanted to do a manicure that incorporated both. So, I did a glitter gradient using Oscar over a base of Natasha. I started with two coats of Natasha, then I did one coat of Oscar starting just above the middle of the nail. Finally I went over my tips, kind of like a French Manicure, with Oscar again. The below picture doesn't even have a top coat on it, so the finishes of these polishes are great! It also hasn't chipped at all & I usually have a ton of problems with chipping. I really love how it turned out, like I said I don't usually wear red-oranges, but I definitely can see using it to accent a variety of nail art designs. I am also excited to pair the gold with other colours such as coral, turquoise, and navy. Overall, I think these are great colours & encourage you to try Julep Maven out. It's only a penny to try & if you aren't happy with the products you can unsubscribe. Honestly, I was planning on just getting my intro box and that's it...until I saw the July box. The July box looks amazing! I decided to "switch styles" & go with "It Girl." It features three different polishes, Mila, Kate, & Daphne. I already have similar colours to Kate & Daphne, but I really like the formula of the Julep polishes. I also am trying to be more conscious about buying products that aren't laden with chemicals & are cruelty-free. Julep doesn't contain any formaldehyde, formaldehyde resin, toluene, or DBP. So slowly but surely, I hope to phase out my cheap nail polishes! If you are getting the July box, you will also be getting a patriotic glitter to match your shipping address. So I will be getting America-The Beautiful. I love the look of this glitter and can't wait (it even has star glitters in it!!) The Canada one is super beautiful as well! This box definitely seems worth $20. That's only $5 a bottle on a polish that retails for $14 each! 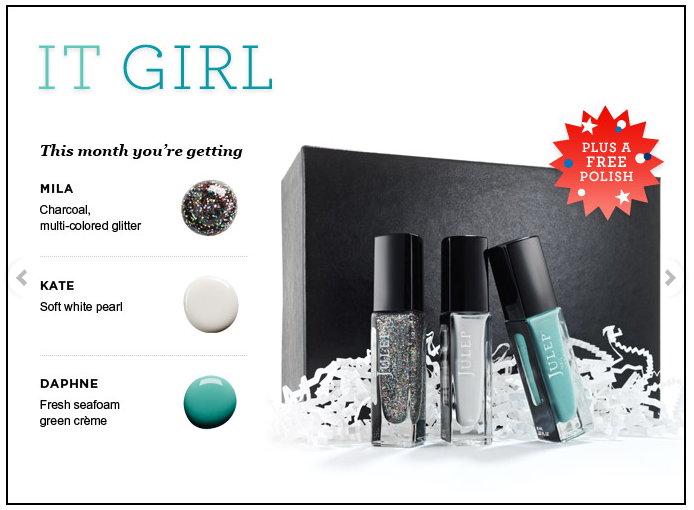 I also have seen people get a coupon for a free polish in their first full-priced box, that would be a fantastic deal! Anyway, I definitely encourage you to try it out, at least for the 1 cent intro box. I know I wasn't expecting to find myself a new favourite brand, but it looks like I did! If you want to join click here and enter the code COLOR2012 or PENNYINTRO after you take the short style survey. Julep Maven is $20 a month, and you are able to switch boxes or skip months. I just joined so I might not always be so thrilled about the box of the month, so I think opting out is a great option! Let me know if you try it & what you think of the service/colours/etc.! just joined! Can't wait to get mine in the mail and try it out!